Add a natural history aesthetic to your home with these locally produced linen prints now available at Block & Chisel. It’s not every day that you come across an artist like Harem, nor is it likely that you’ll find such an artist translating selected works into beautiful décor items quite as well. This is why we have paired up with his design company Hot Coffee to bring you linen wall hangings, pillowcases and throws with Harem’s distinctive artworks printed on them. Foremost a fine artist, Harem has fulfilled commissions for the likes of Richard Branson and the UAE Sultanate. His works feature wildlife in their natural settings, with a style that hails from the bygone era of African explorers. It was at the annual décor trade show SARCDA in June 2016 that Block & Chisel’s MD Paul McAdam stumbled upon Hot Coffee’s creations. He immediately knew these works were something special and would complement Block & Chisel's interior style. Harem says that collaborating with Block & Chisel is a decision based on integrity because of the brand's uncompromising commitment to excellence and craftsmanship. This made it the ideal platform from which to reach South Africans passionate about art and design. His decision to turn some of his paintings into décor pieces was a carefully considered one. It comes with a very important realisation that art is more than just the paint and canvas. Interior décor is an opportunity to make true art accessible to a wider audience. It’s about bringing fine art into the home in a way that enriches our lives and sense of wellbeing. Harem prints a selection of his work onto raw fabric using a high tech digital printer in Cape Town. The result is a range of wallhangings, throws and pillowcases with a vintage feel and a strong natural history focus. 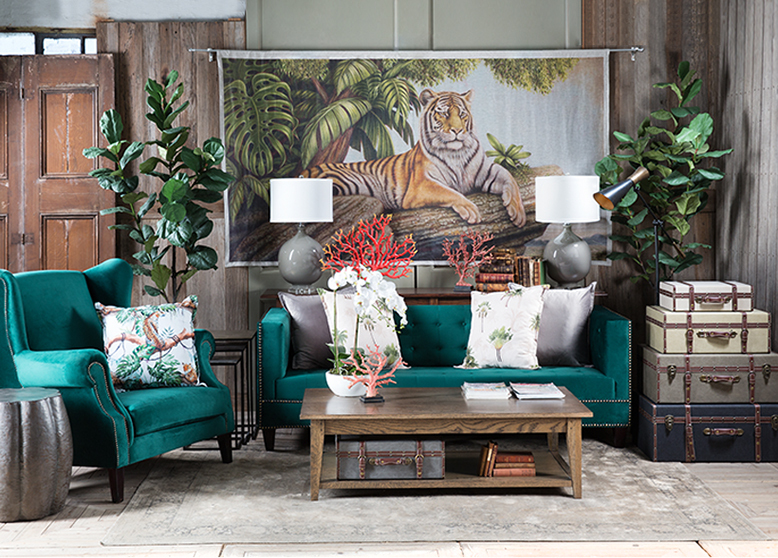 From a rhino standing calmly against a grassland backdrop to a tiger lying regally amidst a leafy jungle, Harem's works are full of life and the natural texture of the fabric enhances the vibrant character of each original piece. Harem’s own fascination with the natural world is a strong source of inspiration for his works. The okapi, a highly endangered antelope found only in the jungles of Central Africa, is one particular animal that has ignited Harem’s imagination and inspired him to offer support and raise awareness for the Okapi Conservation Project in northeastern DR Congo. The project is aimed at conserving the wildlife in the region. Block & Chisel is honoured to be a part of this awareness campaign. If you are as inspired as we are about conservation, you can donate to the project by visiting okapiconservation.org. Make sure you visit one of our stores to find out how you can incorporate these amazing pieces into your home, or browse the collection online. The Block Cafe is open for business!